Even though you may be able to adapt to a space in your mouth after loss of a tooth, over time complications will arise due to movement of remaining teeth and bone loss. The surrounding teeth tend to move into the space. Movement of teeth changes one’s bite. Biting forces that the previous tooth withstood are put on other surrounding teeth and often times at wrong angles due to the rotations that occur. 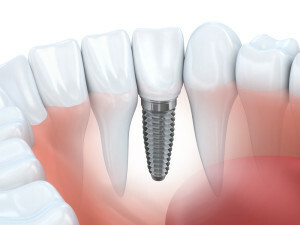 A change of bite and increase in forces can be a spiral effect that causes further tooth loss or need for more dental work. Bone loss not only reduces integrity of bone but causes cheeks to collapse in and possible enlargement of the tongue. If you are missing a tooth, it is strongly advised to make an appointment with your dentist. For further questions, call TODAY!